Sampling and analysis of eruptive products at Mount St. Helens is an integral part of volcano monitoring efforts conducted by the U.S. Geological Survey’s Cascades Volcano Observatory (CVO). 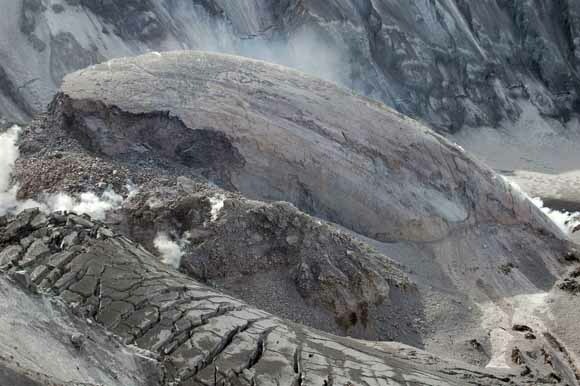 The objective of our eruption sampling program is to enable petrological assessments of pre-eruptive magmatic conditions, critical for ascertaining mechanisms for eruption triggering and forecasting potential changes in eruption behavior. This report provides a catalog of near-vent lithic debris and new dome-lava collected during 34 intra-crater sampling forays throughout the October 2004 to October 2007 (2004–7) eruptive interval at Mount St. Helens. In addition, we present comprehensive bulk-rock geochemistry for a time-series of representative (2004–7) eruption products. This data, along with that in a companion report on Mount St. Helens 2004 to 2006 tephra by Rowe and others (2008), are presented in support of the contents of the U.S. Geological Survey Professional Paper 1750 (Sherrod and others, eds., 2008). Readers are referred to appropriate chapters in USGS Professional Paper 1750 for detailed narratives of eruptive activity during this time period and for interpretations of sample characteristics and geochemical data. The suite of rock samples related to the 2004–7 eruption of Mount St. Helens and presented in this catalog are archived at the David A. Johnson Cascades Volcano Observatory, Vancouver, Wash. The Mount St. Helens 2004–7 Dome Sample Catalogue with major- and trace-element geochemistry is tabulated in 3 worksheets of the accompanying Microsoft Excel file, of2008-1130.xls. Table 1 provides location and sampling information. Table 2 presents sample descriptions. In table 3, bulk-rock major and trace-element geochemistry is listed for 44 eruption-related samples with intra-laboratory replicate analyses of 19 dacite lava samples. A brief overview of the collection methods and lithology of dome samples is given below as an aid to deciphering the dome sample catalog. This is followed by an explanation of the categories of sample information (column headers) in Tables 1 and 2. A summary of the analytical methods used to obtain the geochemical data in this report introduces the presentation of major- and trace-element geochemistry of 2004–7 Mount St. Helens dome samples in table 3. Intra-laboratory results for the USGS AGV-2 standard are presented (tables 4 and 5), which demonstrate the compatibility of chemical data from different sources. For questions about this report, contact Carl Thornber .